TheArmenianKitchen.com : SOAR Needs Your RECIPES! I received an e-mail from George S. Yacoubian, Jr., J.D., Ph.D., volunteer President of the Society for Orphaned Armenian Relief (SOAR), Inc. (http://www.soar-us.org/). He and his wife started this organization after adopting their daughter from Armenia in 2006. 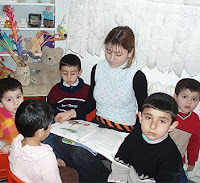 Their mission is to provide humanitarian relief to the orphanages in Armenia. As a fundraising project for next year, SOAR would like to put together an Armenian cookbook. There is already a recipe link on their website for you to view. Mr. Yacoubian has asked if my readers, and I would be interested in contributing any of our favorite recipes for this worthy cause. They are collecting recipes between now and the end of this year. There are no recipe restrictions; just send in what you’d like, BUT, Armenian recipes are preferred. Time is of the essence. I, for one, am game. Please say you are, too!